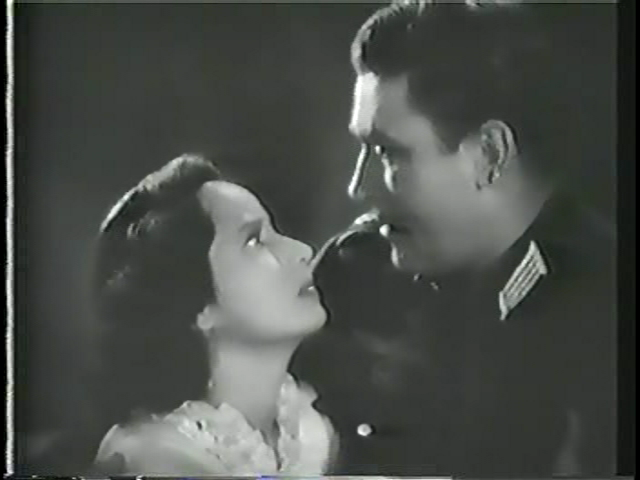 A WWII resistance fighter (Merle Oberon) has an affair with an unsuspecting German major (Carl Esmond), and is able to pass on vital information to the Norwegian underground. When Esmond’s superior becomes suspicious, however, a British agent (Brian Aherne) — formerly Oberon’s lover — is sent to assassinate Esmond. This rather pedestrian wartime melodrama is primarily notable as director Dorothy Arzner’s final feature film, yet it offers little that’s new or different to the genre; as noted so succinctly in the New York Times‘ original review, “Although the film does maintain a measure of suspense quite steadily, its authors and director have failed to stamp it with any distinction or depth of conviction to lift it above the level of a dozen similar mediocre war films.” Oberon is generally fine — and appropriately beautiful (if unconvincing as a Norwegian) — in the leading role (though she doesn’t know how to mime piano-playing for the life of her! 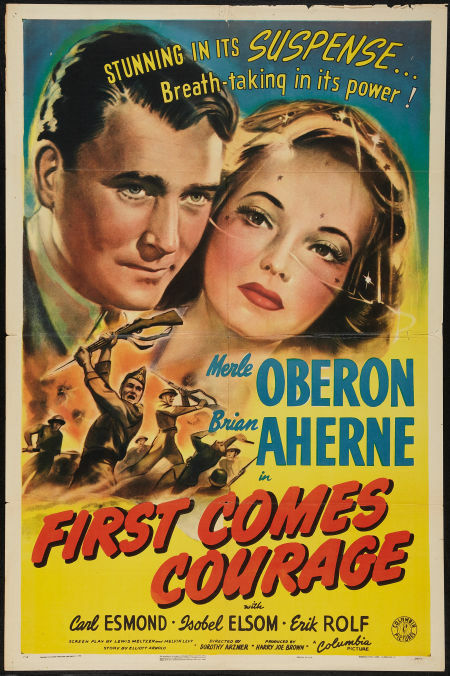 ); faring slightly better is Brian Aherne as her British lover, who at least brings some welcome energy to the proceedings. While one knows that all will (or should) work out in the end, there are at least a few tension-filled moments along the way — ultimately, however, First Comes Courage remains resolutely “ordinary”, and will only be of real interest to die-hard Arzner fans. No; I suspect the only reason this film is listed in Peary’s book is because it was directed by Arzner. Not a must – in just about complete agreement here. Has Oberon ever really been good? Sure, she was exotic-looking, but I don’t recall her ever being more than (as stated) “fine”, which really reads ‘serviceable’. Yes, it’s a relief having Aherne here – but, again, the script gives him some really sappy stuff to say. As is also true when Oberon’s character turns heroic at the end. Throughout the film, we’re subjected to an often-heavy-handed score, which PUNCTUATES when we’re given certain pieces of – usu. dramatic, of course – information. A bit giggle-worthy. I concur with the comment, but would like to add two other objections. First, there is one of my pet peeves about movies which feature foreigners. Instead of having them speak in their native language, characters use accented English. In “First Comes Courage,” Nazi officers speak to each other in English and not German. Likewise, the Norwegian resistance fighters address each other in English and not Norwegian. Ideally, the correct languages would be spoken and viewers could read subtitles. Apparently, studios have concluded that audiences dislike subtitles so much that English has to replace the original language. But if that is the case, why would anyone have an accent? Secondly, I am always puzzled by wartime films which insist in portraying enemy forces as incompetent fools. In this movie, Major Paul Dichter is so taken by Merle Oberon’s character that he gives away military secrets at the drop of a hat. And all that Oberon has to do is flirt with the man–there is no hint of sexuality to be found. By depicting Germans and/or Japanese as such dolts, the effort put forth by the Allies in World War Two is indirectly diminished. How could it have taken Britain nearly six years to defeat such inept Germans?